WASHINGTON — President Donald Trump applauded Republicans for passing a sweeping tax bill Wednesday, convening lawmakers to take a victory lap on the White House lawn after touting it as a "historic" achievement. The president praised top Republicans, including House Speaker Paul Ryan and Senate Majority Leader Mitch McConnell for their hard work on the legislation that had been years in the making. "It's always a lot of fun when you win," Trump said, all smiles for the outdoor celebration. He later remarked upon the magnitude of the day, saying he didn't know if the group would have bigger moments than this, "but we'll try." Trump presided over the event, yielding the podium with fellow Republicans so they could share the "glamour and the glory" of the moment and even making jokes with conservatives who had been integral in the bill's process. At one point, he described the group as "warriors together" as they worked the bill through the process. In another moment, during a shout out for the work done by House Majority Whip Steve Scalise, Trump talked about the Louisiana lawmaker's tough year — a reference to him being shot during a congressional baseball practice this summer. "It's a hell of a way to lose weight, Steve," Trump quipped. 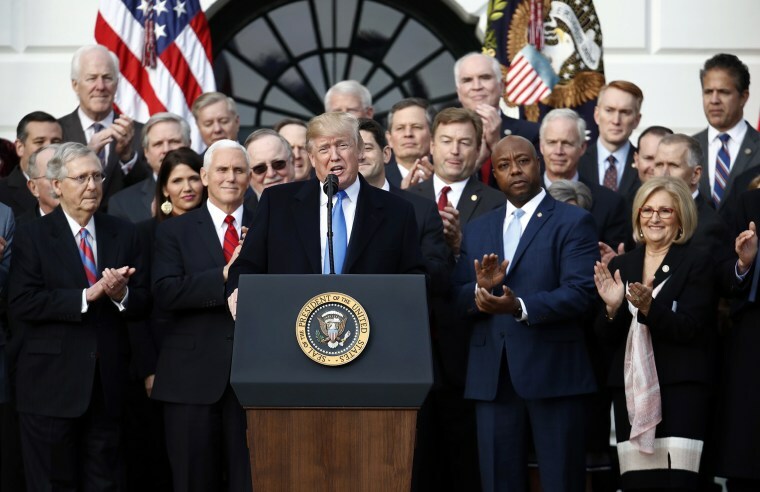 The lawmakers, in turn, heaped praise on the president, who marked his first major legislative achievement by complimenting his leadership and offering assurances that this was just the beginning of accomplishing the Republican agenda. Senator Orrin Hatch, R-Utah, told the president that he's "living up to everything I thought you would" and described him as "one heck of a leader." While Trump had teased a press conference on Twitter if the tax bill passed, he took no questions from the press, who were seated a lengthy distance from the stage. During a cabinet meeting Wednesday morning, Trump called the bill a "historic victory for the American people" and said it would be an "incredible Christmas gift for hardworking Americans." He also touted the lower corporate tax rate that he says will keep businesses in the country. "That's probably the biggest factor in our plan," he said. Trump also got in a grumble about Democrats, who did not vote for the measure. "Unfortunately, the Democrats don't like to see tax cutting; they like to see tax increases," Trump said, saying the party's members "complain a lot" but "don't get it done, unfortunately." A senior administration official later told reporters that the White House "did make a sincere effort to try to win" over potentially persuadable Democrats, like Sen. Joe Manchin, D-W.Va. This official attributed the bill's ultimate lack of bipartisan appeal to politics, more than policy. Democrats opposed the bill as a boon to the wealthy while offering little for the middle class, with House Minority Leader Nancy Pelosi, D-Calif., calling it "the worst bill to ever come to the floor of the House." Trump, who mostly focused his remarks on how the bill achieved long-held Republican goals and allow jobs to "start pouring into the country" as a result, also trumpeted the repeal of the individual health care mandate, a key component of Obamacare, which was tucked inside the legislation. “We have essentially repealed Obamacare,” Trump claimed, though previous attempts to fully repeal and replace former President Barack Obama’s cornerstone health care legislation failed repeatedly on Capitol Hill earlier this year. Vice President Mike Pence offered congratulations to the president for what he called a year of work that restored American credibility on the world stage, while delivering on a "middle class miracle" back home. Trump has previously said the tax bill would cost him "a fortune," but an NBC News analysis of an earlier draft shows he and his family could save more than $1 billion. Asked about this Wednesday, Trump ignored the question. The president trumpeted the legislation on Twitter Wednesday morning, calling the tax cuts "so large and so meaningful," promising more "Jobs, Jobs, Jobs!" to follow. Trump's celebration of the tax bill's success will be a full day affair on Wednesday. The president will entertain Republicans from the House and Senate to fête the bill's passage at the White House, though he will not sign the bill at that time.